Of course, you have been to New York City and you think you have seen it all. The Statue of Liberty, Wall Street, Central Park, and you even walked down Broadway…you name it. 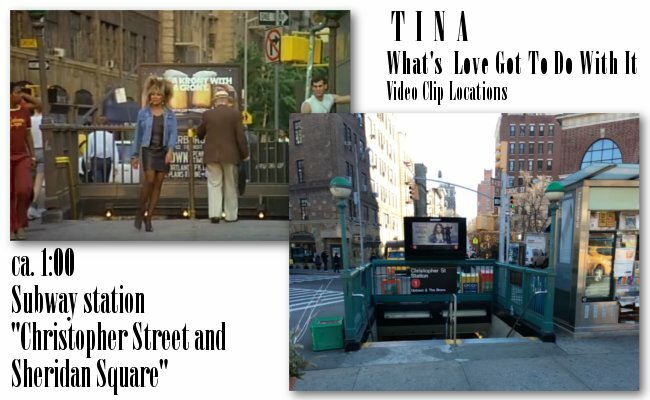 But in fact, as a real Tina Turner fan you only have seen everything NYC has to offer when you paid a visit to the locations for the “What´s Love Got To Do With It” promo video clip. Blog photographer Stephen (who has his own Facebook group for top TINA photos) went all the way from Dallas, TX to the famous sites where they shot Tina Turner´s video for her #1 hit. And next time you go to New York City for yourself, you can use this extra-nerdy top-secret tourist guide for your tour! The opening scene takes place at Brooklyn Heights at Brooklyn Bridge, NY where you can enjoy a fantastic view of Manhattan´s skyline throughout the day. The Subway Station is at Christopher Street and Sheridan Square where you have to stop by anyway because … well, because it is Christopher Street, right? Going to NYC just for a fence might sound weird to your friends but we are talking about ta special chain length and wrought iron fence which you can find at James J Walker Park New York, NY 10014. If you mastered the fence you can continue going down the road to … being extremely interested, let´s put it that way. And then you like to find a certain wall at 39 and 41 Commerce Street New York, NY 10014. And there, we even have our photographer Stephen in the photo and in front of the famous wall. This is why you would like to come to the Big Apple again – trust us, who cares about the rest of the sites when you can have THIS?! You might consider sending this and maybe also more regular photos to your What´s App family & friends groups. Trust us on this as well. And what would be a tourist guide without a proper map? You can find it on Google Maps. Here are landmarks in NYC where things pertaining to Tina Turner have been doing. See the map. Most are in the west village. The fun things would be to go to the places and take selfies with those places. Suggestion go do that with Autumn and we’ll post in on the Tina blog. Next PostNext TINA77: Coming This November!